Railpictures.ca - Bill Thomson Photo: In this view, a detouring CN freight on CP at Smiths Falls is pictured pulling out of the station past a nearby CP freight at the station, with CN SD40-2W 5335 leading leased Conrail C40-8W units 747, 752 and 748. For a photo of the trailing units: http://www.railpictures.ca/?attachment_id=35537. | Railpictures.ca – Canadian Railway Photography – photographie ferroviaire Canadienne. 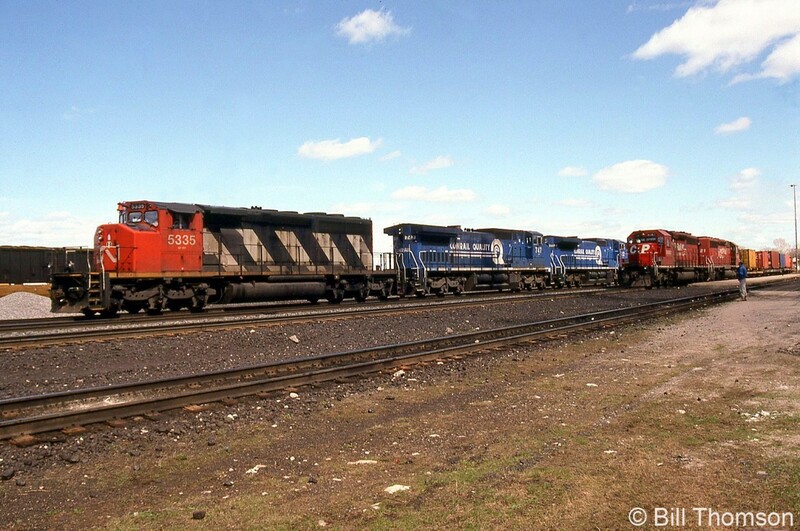 Caption: In this view, a detouring CN freight on CP at Smiths Falls is pictured pulling out of the station past a nearby CP freight at the station, with CN SD40-2W 5335 leading leased Conrail C40-8W units 747, 752 and 748. For a photo of the trailing units: http://www.railpictures.ca/?attachment_id=35537.